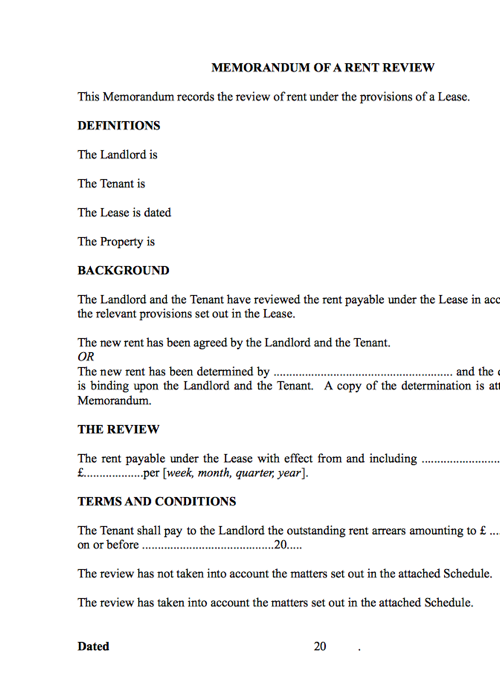 A short one-page memorandum recording terms agreed between a landlord and tenant following a rent review under a lease. The memorandum details definitions, background, the review and relevant terms and conditions. 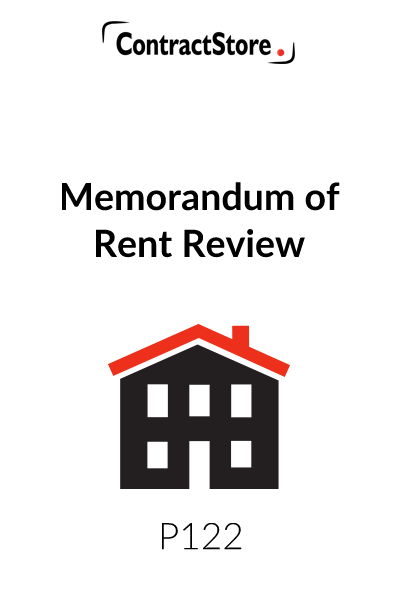 This Memorandum is designed for use by a landlord and tenant when the rent payable under their Lease has been reviewed. It should be used to record the review and any other terms which have been agreed relating to the review. It is advisable that the parties sign a Memorandum to avoid any disagreement, particularly as there may be a new landlord or tenant at some time in the future. The review will be a review of the rental figure in the Lease. Most leases provide that the rent is reserved as an annual payment, even though it may be payable by instalments relating to shorter periods. The Memorandum should not be used to record any changes to the terms of the Lease. This should be done by a separate Deed of Variation. It may be that the review results in the tenant being required to complete a Stamp Duty Land Tax Return for filing with H M Revenue and Customs, particularly if the review amounted to an abnormal review. There may then be a liability to pay stamp duty land tax. The tenant should refer to the web page of H M Revenue and Customs (www.hmrc.gov.uk/so/index.htm). The full names of the current landlord and tenant should be given along with their respective addresses. If either party is made up of more than one person, then all names should be given. If either party is a company, then its full company name, registration number and registered office should be given. The date of the Lease should be given and, if the original parties to the Lease are not the current landlord and tenant, then the names of the parties from the Lease should be given after the date. The new rent may have been agreed by the parties or they may have appointed an expert to determine it. One of the paragraphs should be used for this, or amended to give the correct position. Complete the new rent here and state the period. The figure should correspond to the rental figure in the Lease rather than the instalment figure. As mentioned above, this will usually be “per year”. If any arrears are to be paid by the tenant, then the details should be recorded. The review may have taken place after the actual review date and so there may be some rent owing at the new rate since the review date over and above the rent paid by the tenant at the old rate. 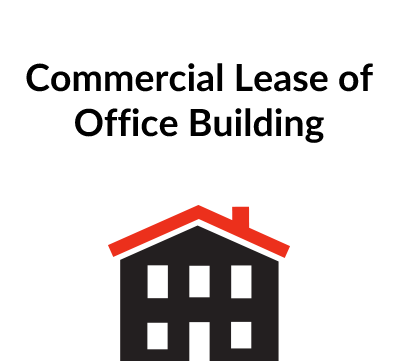 The Lease may contain stipulations about this, but the parties should record their agreement about any payment to be made. The review may also have ignored certain matters, such as improvements to the property carried out by either of the parties. There may have been special matters taken into account, such as a change in the planning status for the area in which the property is situated. These matters should also be recorded here or perhaps in a separate Schedule. The Lease may stipulate what matters are to be ignored or taken into account in any rent review. The Memorandum should be prepared in duplicate with each copy being signed by all the parties. The date of the signing should be inserted. 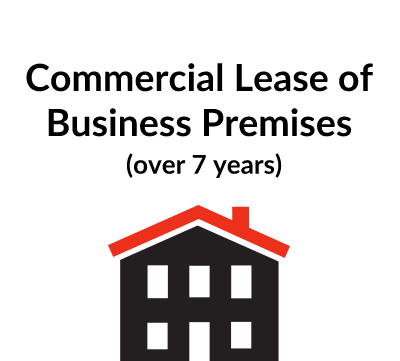 The landlord should attach a copy to the counterpart Lease. The tenant should attach the other copy to the Lease. If a Stamp Duty Land Tax Return has been filed by the tenant, then a copy should be placed with the Memorandum along with a copy of the acknowledgement from H M Revenue and Customs.